Looking for a simple asparagus recipe? 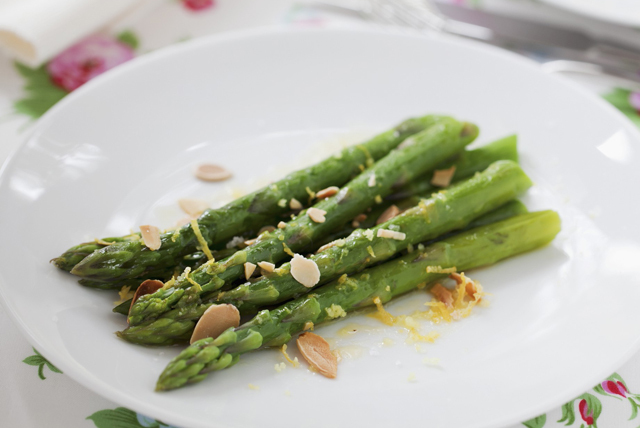 Try our Citrus Asparagus with Toasted Almonds - a great side dish to prepare using garden-fresh asparagus. Place asparagus in steamer basket set over half-filled saucepan of boiling water; cover. Cook on medium heat 3 to 4 min. or until asparagus is crisp-tender. Drain asparagus well; place in shallow dish. Add dressing and lemon juice; mix lightly. Transfer to platter. Sprinkle with lemon zest and nuts. When a skillet dish calls for toasted nuts, there's no need to heat up the oven. Simply cook the nuts for a few minutes in an ungreased skillet on medium heat until lightly browned, stirring frequently. Serve with cooked salmon and new potatoes.